Be the first to share your favorite memory, photo or story of William Dean. This memorial page is dedicated for family, friends and future generations to celebrate the life of their loved one. 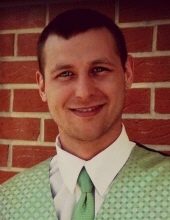 William Dean “Chip” Bradley, 37, of Fostoria, passed away Thursday, November 22, 2018. He was born March 11, 1981 in Fostoria to James Cecil Bradley Jr of Oneanta, AL and Kathie (Brian Snyder) Sheridan – Bradley of Findlay. He married Jennifer K. Shultz May 24, 2008 in Findlay, and she survives in Fostoria. Also surviving are sons, Damien T, Malakai X. and Caine P. Bradley at home; brother, Phyllip (Stephanie Schroeder) Bradley, Fostoria; sister, Heather (Brian) Bradley-Dennis, Birmingham, AL; maternal grandparents, Jeffrey and Peggy (Paul) Cooper, Fostoria; along with many aunts, uncles, nieces and nephews. He was also preceded in death by paternal grandparents, James and Bobbie (McDonald) Bradley. Chip had worked at National Electrical Carbon, Fostoria and most recently NOX US, Fostoria. Visitation is Friday November 30, 2018 from 2-4 pm at HOENING FUNERAL HOME 242 W. Tiffin St., Fostoria. Words of reflection will be held at 4 pm at the funeral home. A gathering will follow at KemoSabes Restaurant, Fostoria. In lieu of flowers, memorials are suggested to the family’s choice c/o Hoening Funeral Home. To send flowers or a remembrance gift to the family of William Dean "Chip" Bradley, please visit our Tribute Store. "Email Address" would like to share the life celebration of William Dean "Chip" Bradley. Click on the "link" to go to share a favorite memory or leave a condolence message for the family.